Can your colleagues spot a phishing attempt? It happened to the DNC. Don’t let it happen to your business. Hey Sir and/or Madam, can you identify a “phishy” email? Can your colleagues? With the recent email hacks of the Democratic National Committee, cybersecurity firms may consider shifting their focus to employee training and email security. That’s what we’re going to do with this newsletter, anyway. Email is one of the most common entry points for data theft, which is why training your employees to spot phishing scams and malicious links is so important to the success and well-being of your business. If you’re curious to know whether your company is sufficiently protected against hacking attempts and other possible IT issues, take our self-diagnosis quiz! Or better yet, contact Pendello Solutions for a free technology discovery dialogue to identify specific potential IT issues within your business. Finally, your culinary masterpieces will get the recognition they deserve from your friends and co-workers. 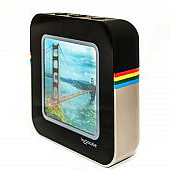 The Instacube is a digital photo frame that displays images from your Instagram feed in real time. This wireless, touch screen photo gallery can be programmed to live stream specific hashtags or account feeds. The device typically retails for a strangely unrounded price of $202.49, but you can have one for free simply by referring a customer to Pendello Solutions this month! While many companies are making investments to ensure their networks are secure from data theft, some overlook the most common way for hackers to gain access to your critical data — email. Between 2010 and 2014, phishing attacks rose by more than 162 percent. Phishing scams present some very large-scale oppor-tuna-ties for cybercriminals. And please excuse the fish puns. We tried to stop our writer guy, but he was pretty re-sole-ute. So buckle up. Well, we’ve got just the thing! Fill out our technology self-assessment quiz below to find out if your organization has warning signs of impending business technology issues!